A simple IIS log rotation Windows service with automatic/manual log location discovery and subfolder traversal for IIS 6 (Windows Server 2003), IIS 7.x (Windows Server 2008) and IIS 8.x (Windows Server 2012). The complete VB.Net source code is included in the download package. Download the zip file matching the server's IIS version and extract it to the server's "Program files (x86)" or "Program files" folder. Open IisLogHousekeeper.exe.config in a text editor and adjust the schedule, the log retention period and optionally the manual log locations (see configuration reference further down this page). Install and start the service by running ServiceInstall.vbs. The service can be uninstalled using ServiceUninstall.vbs. Check the service status in the Windows Application Event log. Events will be marked with the name "IisLogHousekeeper". Microsoft .Net framework 2.0 or newer is required for the service to install and run. During the service installation, the service exe file will be automatically compiled from the source code file using the newest .Net framework version installed on the computer. The standard disclaimer: The program is provided 'as is' without warranty of any kind. I have done my best to incorporate graceful exception handling and to test the code in different scenarios, so it shouldn't be able to do anything bad or unintended. But I guarantee nothing. 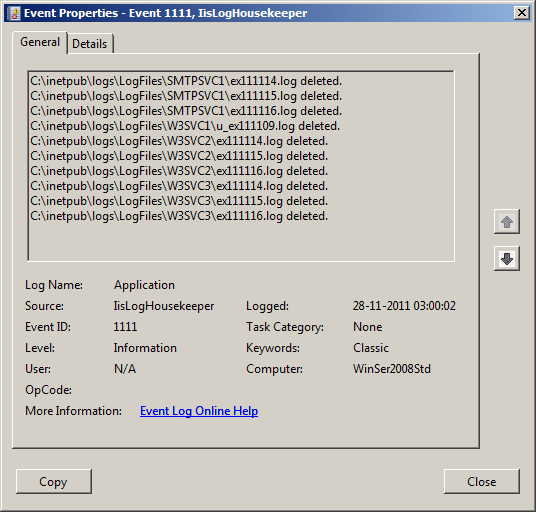 This IIS log housekeeper service is a further development of my old VBScript automatic log housekeeping scripts. But they differ in functionality. If you also need archiving/compression of log files, they should be used instead. Dim sRunResult As String = ""
Dim sFolderList As String = ""
"\W3SVC" & deIisNodeObj.Name & "|"
"\SMTPSVC" & deIisNodeObj.Name & "|"
"\MSFTPSVC" & deIisNodeObj.Name & "|"
Dim sReturn As String = ""
Dim sTempString As String = ""
sFolderList = sFolderList & oWebsite.LogFile.Directory & "\W3SVC" & oWebsite.Id.ToString() & "|"